Long back, by the end of June 2011, Google plus a.k.a Google+ was released as an 'invite only' trial product. Lucky me, I got an Google plus account on July 4th. It was great exploring the new concepts - Circles, Sparks, Hangouts. Everyone should be having an account in Google's New Social networking site as its no more a test product and it was officially launched to the public on September 20th. To read more on Google plus have a check on Google's Official Blog. With so many Social sites available its really tough to be in just one site these days. Myspace, FaceBook, FourSquare, Friendster, Last.fm lots more and even Google's own products like the Orkut, Google Buzz, Google Wave, iGoogle. Its definitely impossible to upload photos in all the sites you have an account. Why not transfer photos from one to the other? Too many steps huh? 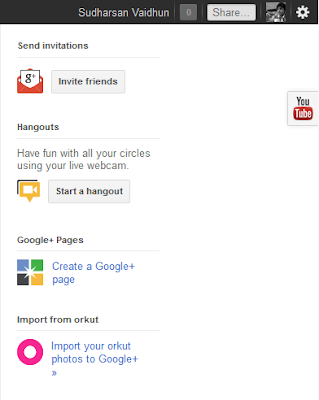 Now there is an option in Google plus itself. But dont forget to change its privacy settings, Thats most important in security as well sharing!